(UM Legislative News Service) The Senate Judiciary Committee is considering a bill that would require Montana crime labs to test all sexual assault kits collected from survivors. 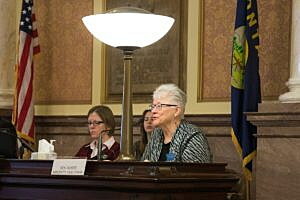 Sen. Diane Sands, D-Missoula, introduced Senate Bill 52 before the committee on Tuesday. Chief Deputy Attorney General Jon Bennion said the new legislation comes after a report that uncovered more than 1,000 untested kits across the state. He said law enforcement had several reasons they didn’t send sexual assault kits to be tested, with the most common being dropped cases or shifting personnel. Bennion said testing these kits now — some of which are 23 years old — can still have value. The proposed law would expire in 2023 and, according to the fiscal note on the bill, would cost the state a little less than $600,000. Bennion said the time limit is to to smooth out the process. The request for funding comes from the concern that the State Crime Lab in Missoula, the only facility equipped to test the kits in the state, would not be able to process the new influx of sexual assault kits it would receive. Bennion said the lab would then outsource the testing to out-of-state facilities, costing about $600 for each kit.